Mobile Phone has become very effective tool in modern world mode of communication. Even in Developing countries like Kenya (as shown in video below) it is easily accessible (thanks to china’s cheap manufacturing) and airtel (cheap phone calls) mobile is within the reach of poor, but problem is how to charge a phone without a supply of electricity. In Kenya and other developing countries in Africa, charging a phone is big challenge because electricity is still a distant future for them. People needs to travel long distances from their home to get there phone charged from paid kiosks. To solve this problem, mechanical engineering students of Kenya have taken a initiative to make pedal powered charger which generate enough electricity to charge basic mobile device. 2. 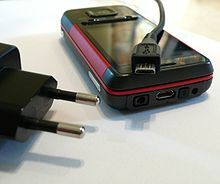 A voltage regulator consists of a rectifier to convert the up and down un-steady AC to a DC, a capacitor to level out the DC voltage and produce a steady inflow voltage to the voltage regulator and then the voltage regulator which allows only a steady 5 volts going into the cell phone. It helps us to allow right amount of voltage for cell phone (5 V and 0.008 A), with a metallic casing to protect it from harsh weather. 3. A cell phone case with Velcro straps to hold it to the bike frame or handle bars.